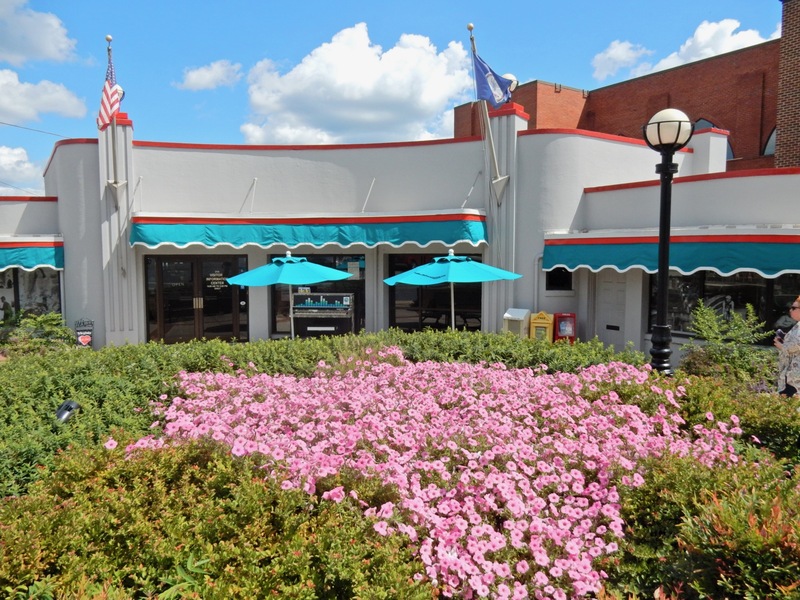 WHY GO: That a Black family, indeed a whole block of African American intellectuals would find safe harbor and thrive in a place called Lynchburg VA in the early 20th century is both testament to the town’s namesake, the Quaker, John Lynch, and its surprisingly progressive history. Over an hour from a major highway (I-64), and two hours from a large city (Richmond), Lynchburg VA was an unlikely center of industry, and an even unlikelier place for a Victorian-age Women’s College to thrive. 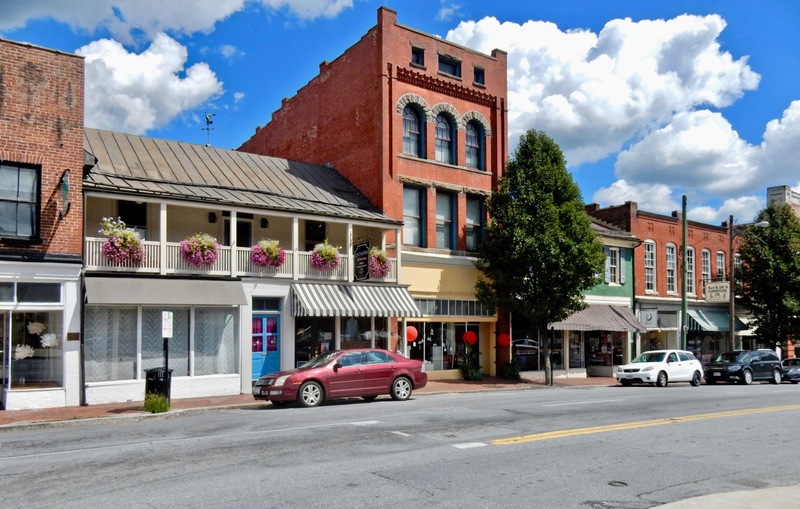 But this town, on the Western side of the Blue Ridge Mountains, had two advantages – the James River and the Railroad – both offering quick and easy shipping of goods to points all over the globe. 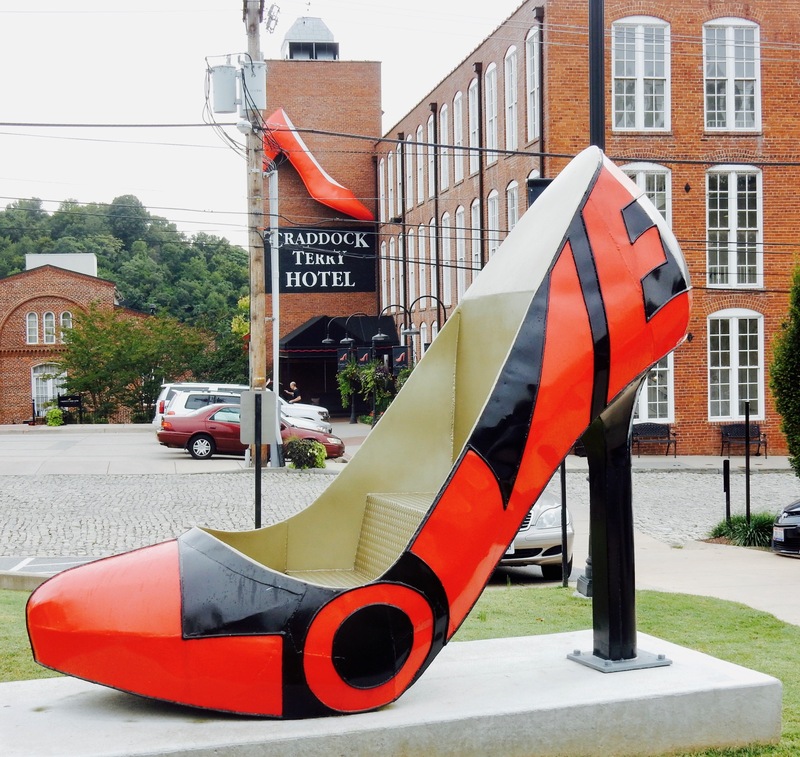 Lynchburg has quite a few such surprises, including a funky new boutique hotel, and is fantastic for visitors on a budget. In fact, most attractions – museums, National Parks – are free. 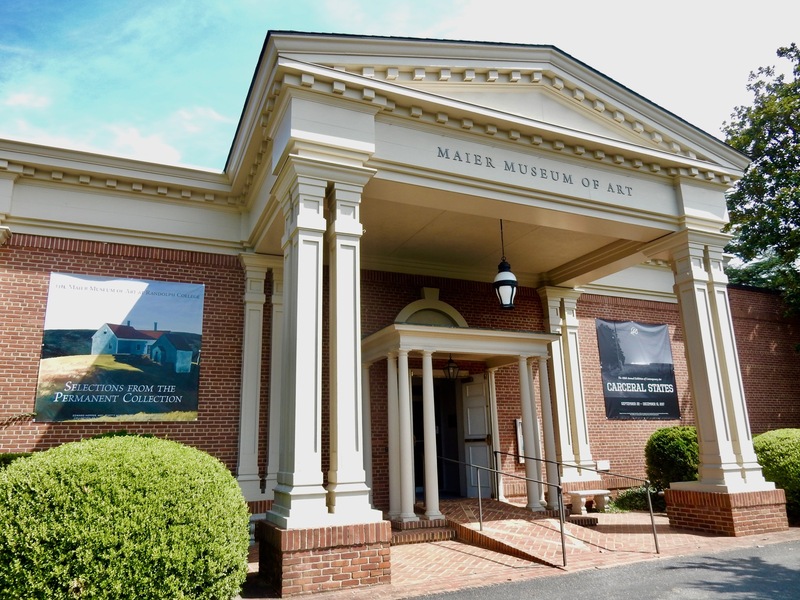 VISIT: Maier Museum of Art, on campus of Randolph College. 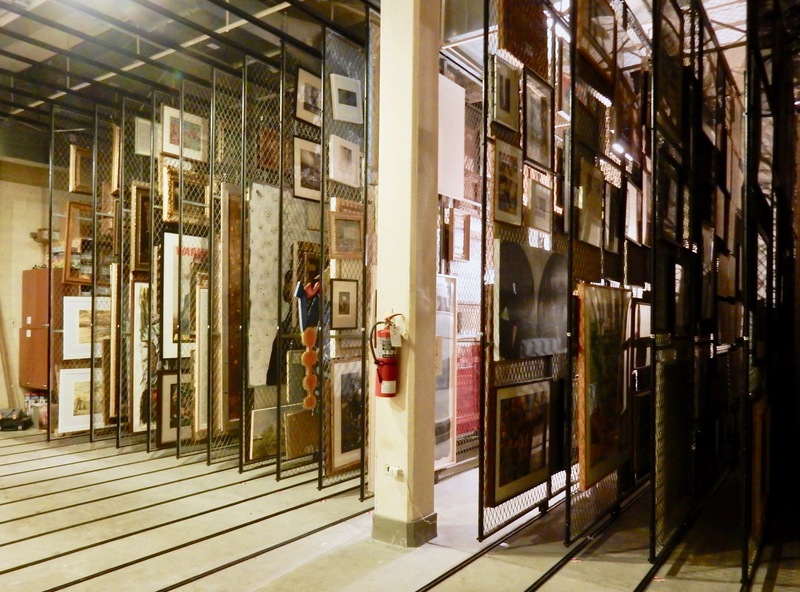 The building that now houses major works of art collected piece by piece over the last 106 years was actually built, in 1951, for a completely different reason: as a safe repository for the National Gallery in Washington DC. Three and a half hours from the nation’s capitol, Lynchburg was considered “outside the blast zone” in the event of an atomic bomb attack. In 1983, the National Gallery finally allowed the structure to be used as a museum for Randolph College students. Established in 1891, the Randolph-Macon Women’s College (which went co-ed in 2007) began mounting yearly art exhibits, thanks to Art Professor and early champion of American Art, Louise Jordan Smith, who realized that though she couldn’t take students to New York, she could bring collections of modern art to this small Virginia town. Since 1911, the college has purchased one piece each year for its permanent collection – it is now in its 106th year of uninterrupted acquisitions focusing on art from the 19th-21st centuries. From 1911-1983, these works of art were scattered around campus. 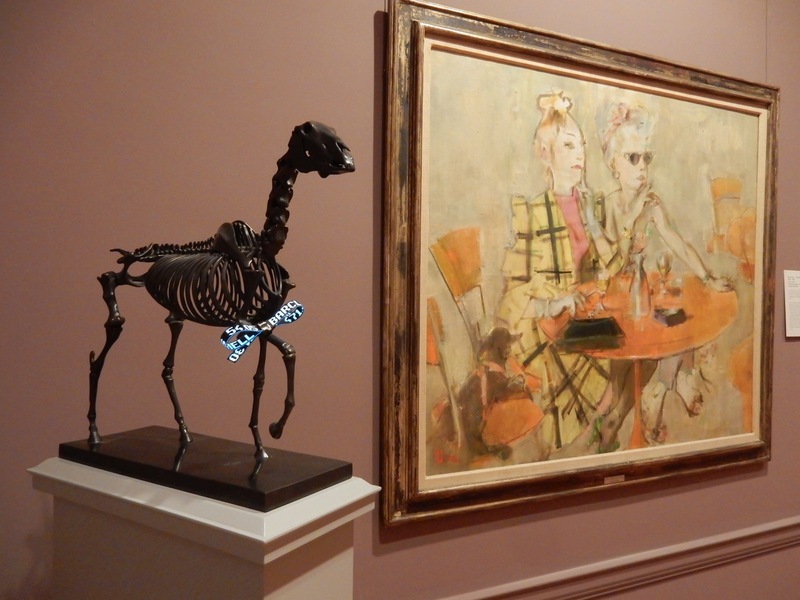 But now, you’ll find the paintings of Winslow Homer, Gilbert Stewart, Mary Cassatt, Milton Avery, Georgia O’Keefe, Edward Hopper, and plenty of others acquired “when the paint was still wet” in four beautifully lit galleries. Tues-Sun 12-5 during academic year. Wed-Sun 1-4 Mid-May-Mid July. Free. TOUR: Anne Spencer House. The precocious Anne Spencer, a beautifully exotic looking Harlem Renaissance poet born in 1882 and sent to college at age 11, moved to the now historic Pierce Street (also home to Dr. Robert Walter “Whirlwind” Johnson, a physician and tennis coach who trained Althea Gibson, Arthur Ashe, and other promising players in his backyard court) at age 21 with her devoted husband, Edward, and two young children in tow. Edward was a self-taught architect, builder and visionary artist, who drew the design for this wildly decorated home on a napkin. Inside, the bubblegum colored walls and décor would put a strutting male peacock to shame. 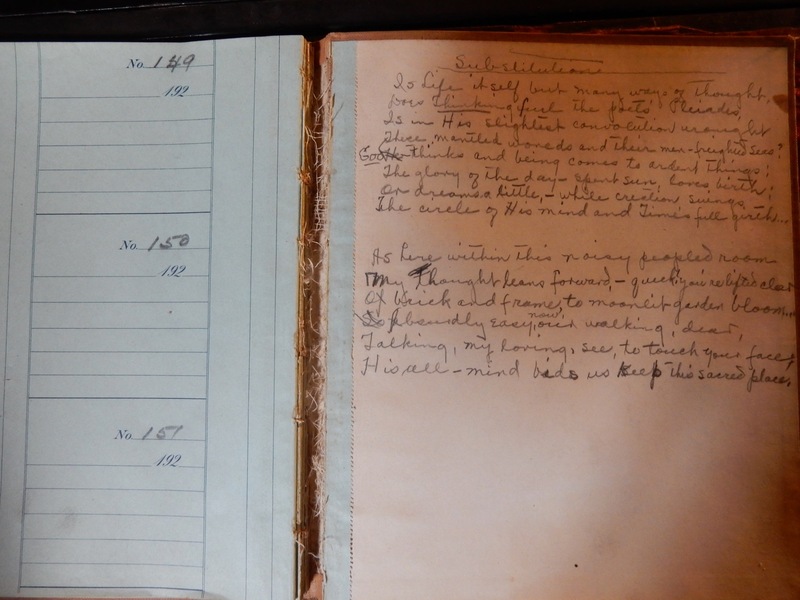 Like another famous poet, Emily Dickinson, Spencer wrote on every scrap of paper she could find, including Edward’s used checkbooks. The walls of a phone booth that Edward built for her just off the small living room are blanketed with phone numbers of friends and family. These friends included some of the most celebrated Black men of the time – Adam Clayton Powel, who spent his honeymoon in the home, Langston Hughes, Martin Luther King, Jr., and co-founder of the NAACP, W.E.B Dubois. 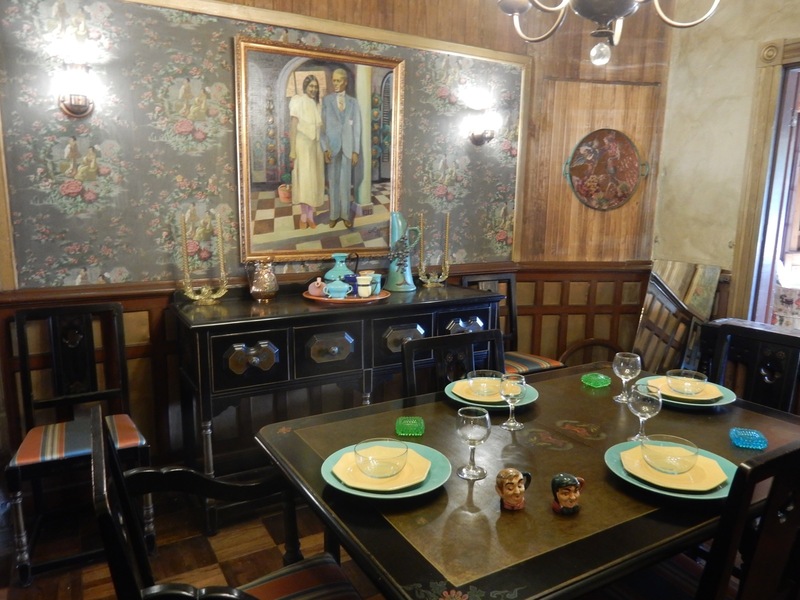 The dining room, though small, could serve as a full-page spread in a lifestyle magazine – and visitors can just imagine the important people who sat around the table. Edward kept adding oddly beautiful found objects to the home and out back in the well-tended garden. 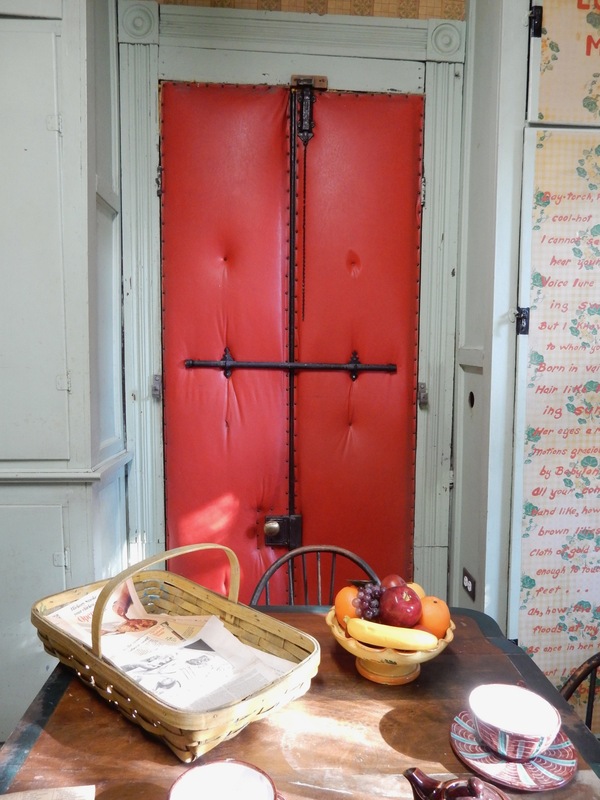 The padded red door in the kitchen came from a segregated movie theater. 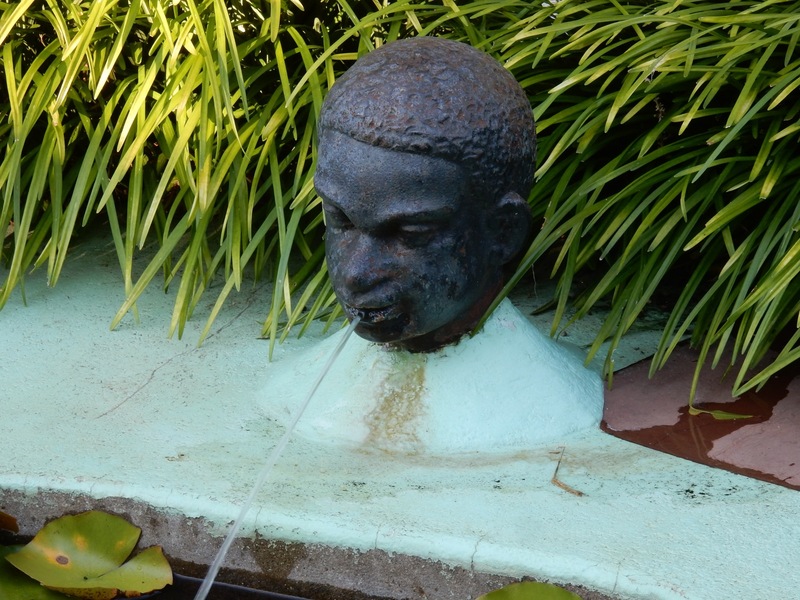 The garden, including the small fountain (built by Edward for “Anne’s pleasure”) with a cast iron head of a Black man spitting water (a gift from DuBois), has been restored to the way it looked in 1937. 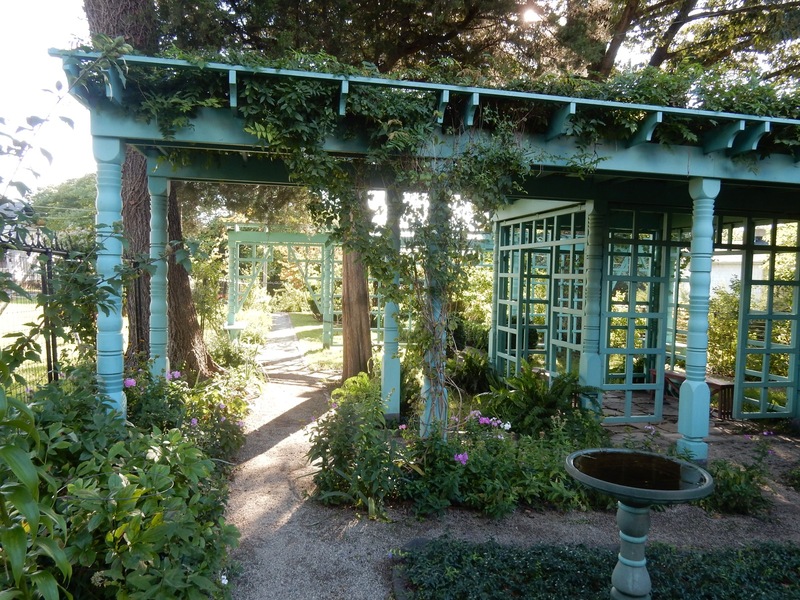 Forty five feet wide and the length of the whole block, the garden is enclosed within wrought iron fencing that came from Randolph-Macon Women’s College. Anne’s writing retreat– the Garden Cottage – is jammed with photos of her family, thanks to a collection provided by her son, Chauncey, an unsung hero himself. One photograph shows Chauncey receiving the Exceptional Service Award from the U.S. Air Force, as he was an African-American pilot who pushed for integrating the military in a precursor to the Tuskegee Airmen. The house and gardens are almost as Anne left them at her death in 1975 at age 93. Garden open dawn to dusk daily, house by appointment only. TOUR: Lynchburg Visitor’s Center Walking Tour with Judi Harvey. 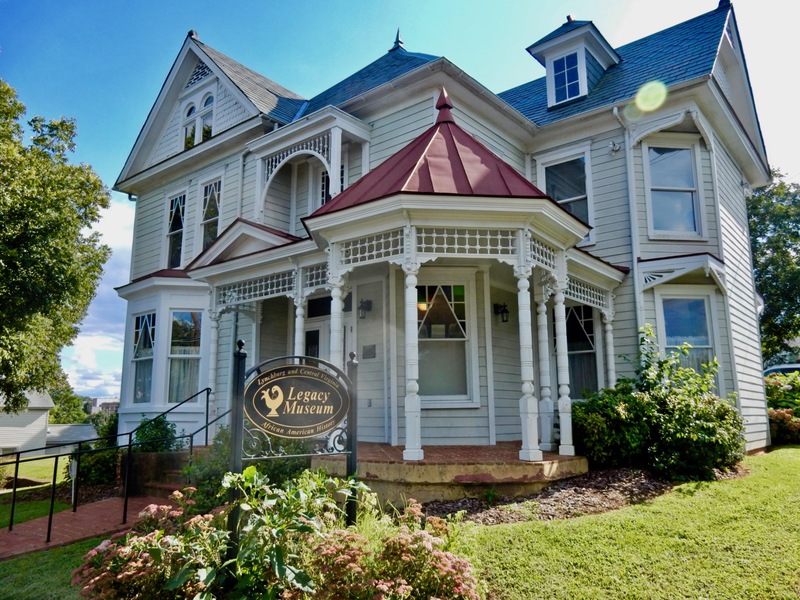 The town of Lynchburg leans into a steep slope (it’s called “the Hill City” for a reason) so spitfire Judi Harvey has to be in great shape to lead these one-hour tours on a daily basis. 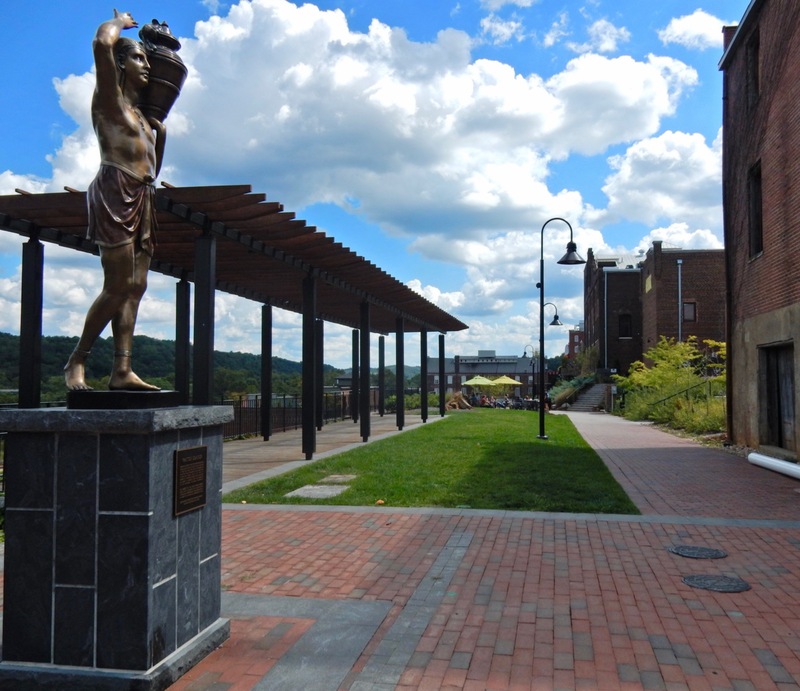 She brings you from the Visitor’s Center, formerly a gas station, down to the “Bluff Walk” – a brand new esplanade perched above the railroad tracks and James River beyond – as she discusses Lynchburg’s status as the second wealthiest per capita city on the East Coast (whaling capital, New Bedford MA, was No. 1), as tobacco grown here could be shipped all over the country via the James River. The first railroad was built in 1848, increasing to three railroad companies by 1861. In 1855, the Lynchburg Courthouse (now the Lynchburg Museum) was built atop the 139 steps of Monument Terrace – overlooking the river and town below. During the Civil War, the town was turned into one big hospital for 30,000 wounded at Manassas. After the war, shoes supplanted tobacco as the dominant industry, and buildings arose to accommodate the newly rich and a populace eager to be entertained. In 1880, cobblestone streets were paved and in 1887, the electric street car rattled through town. Lynchburg parades were legendary: Annie Oakley, Buffalo Bill Cody, clowns and Circus acts came through regularly. Opera houses, theaters, and department stores were erected. Houdini, John Philip Sousa, and a young actor named Ronald Regan preformed here. In 1913, a luxury hotel, The Virginian, was built to host company executives, but like much of downtown, fell into decline and became Section 8 Housing. 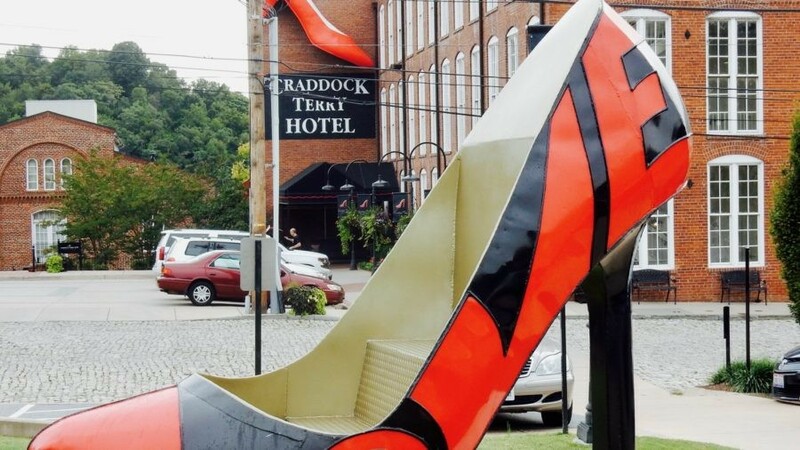 Soon, however, the Virginian will open again as a boutique hotel, joining the Craddock Terry Hotel recently carved from a shoe factory and tobacco warehouse. New life has been breathed into the Academy Center of the Arts, and buildings that line Main St. once again reflect forward-looking, more affluent days. Keep up with everything going on at the Lynchburg Visitor’s Center, and by all means, enlist the guide services of Judi. Open daily 9-5. JUMP ON: The Hopper – Downtown Circulator. It’s a free bus that takes you throughout the downtown area. Mon-Fri midday and Sat mornings. CLIMB: Monument Terrace. 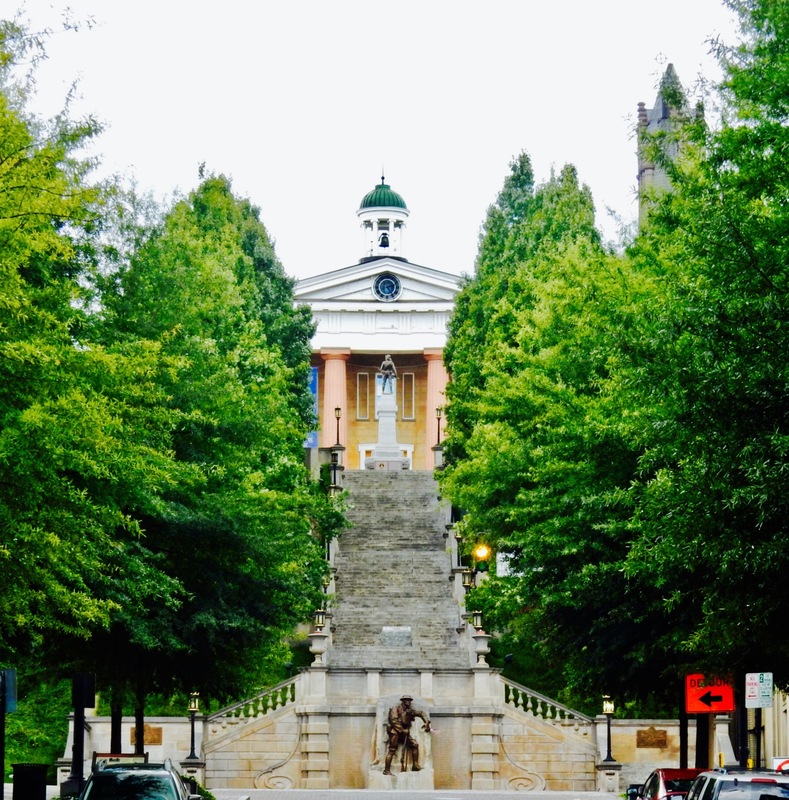 Ascend 139 steps up this grand staircase leading to the Lynchburg Courthouse (now Lynchburg Museum), and pause to read the 11 markers and monuments on 10 landings honoring those who lost their lives in all battles from the Civil War on. VISIT: Lynchburg Museum. Desmond Doss, the pacifist-medic whose story was told in the blockbuster movie, Hacksaw Ridge, was from Lynchburg. 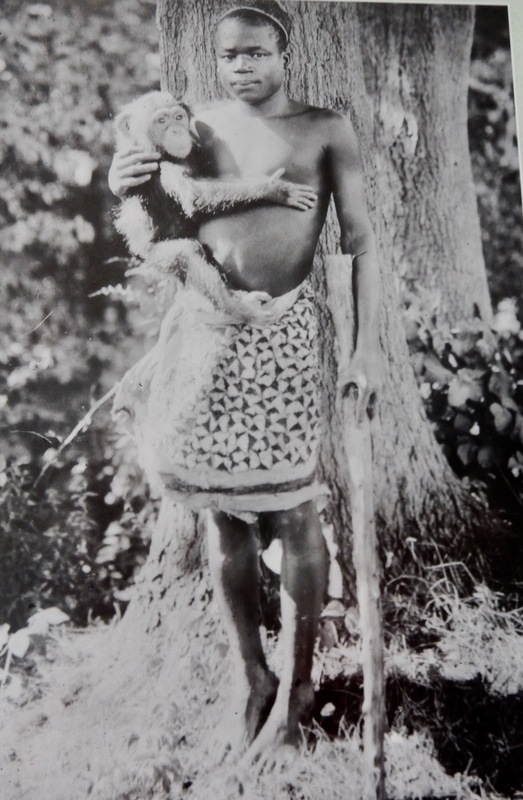 Ota Benga, a Congolese Pigmy exhibited in the Monkey House of the Bronx Zoo in the early 1900’s, was rescued by faculty at the nearby Virginia Seminary and brought to Lynchburg (he committed suicide in 1916). 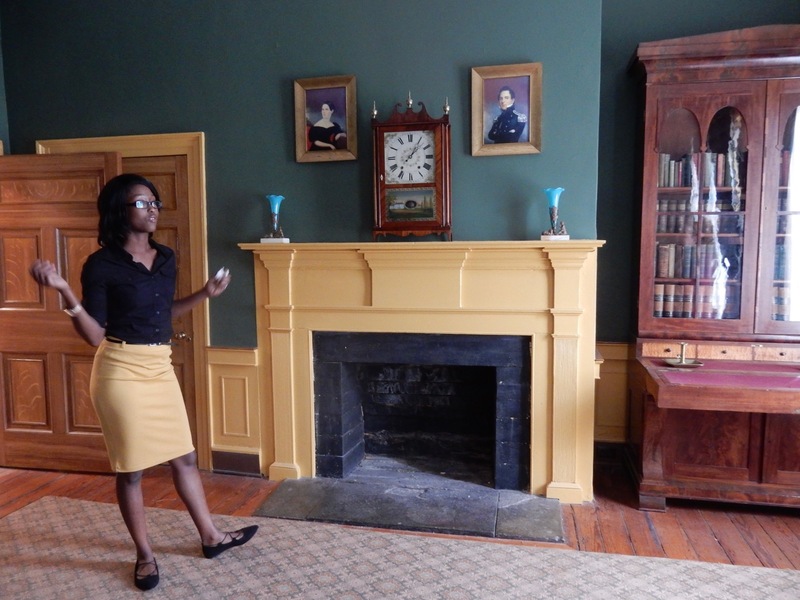 Find out more at this well-designed three-story museum that opened in 2008 inside the 1855 Lynchburg Courthouse at the tippy top of Monument Terrace. Four hundred years of Lynchburg history deserves an hour of your time. Open Mon-Sat 10-4, Sun. Noon-4, free. TOUR: Point of Honor Mansion. 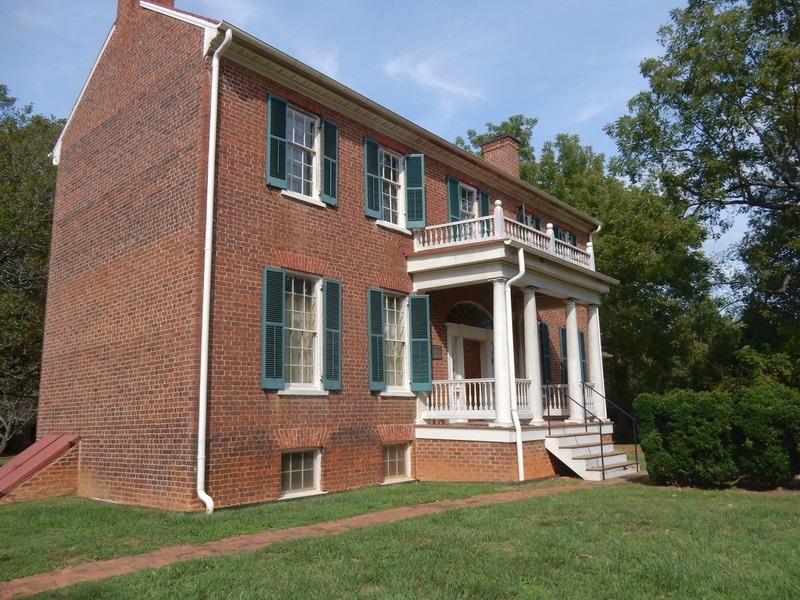 On Daniel’s Hill (one of seven Historic Districts in Lynchburg), the symmetrical Federal-style Point of Honor Mansion represents the wealth gleaned from America’s early transportation trade. 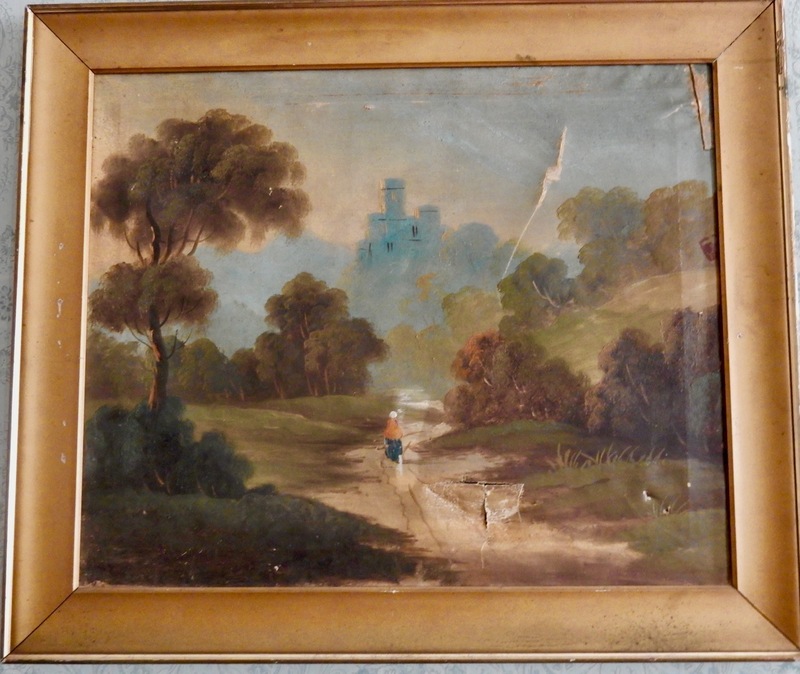 Built in 1815 by Patrick Henry’s personal physician, Dr. George Cabell, who also owned a fleet of bateau riverboats that he rented to tobacco farmers, Point of Honor was indeed that, as the estate, high on a hill, overlooked the town and industry below. Woodwork and wall colors are original after a 1970’s restoration. 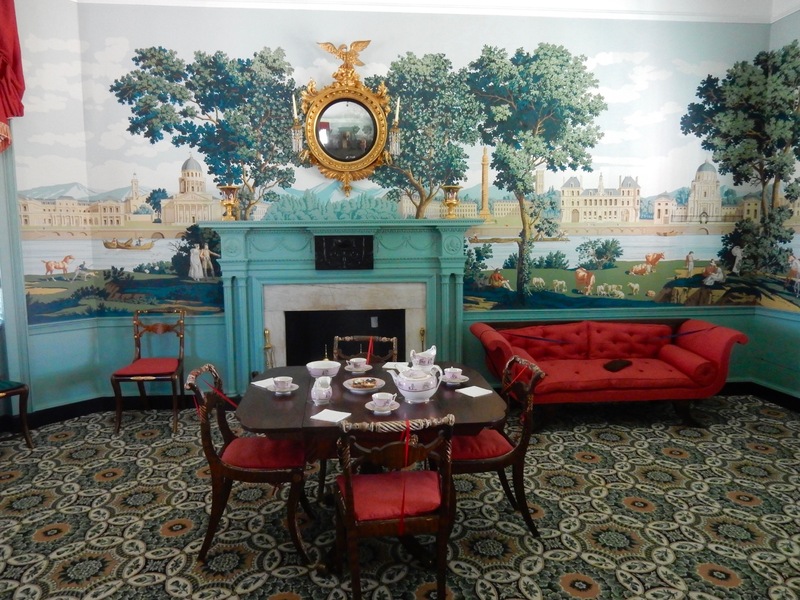 The parlor is the most extravagantly decorated – with a reproduction of a popular wallpaper mural of the day: the panoramic, non-repeating “Monuments of Paris,” encasing the whole room inside the City of Light. That one feature alone makes a 30-45 minute house tour completely worth it. Open Mon-Sat 10-4, Sun Noon-4. VISIT: Legacy Museum of African American History and Art. 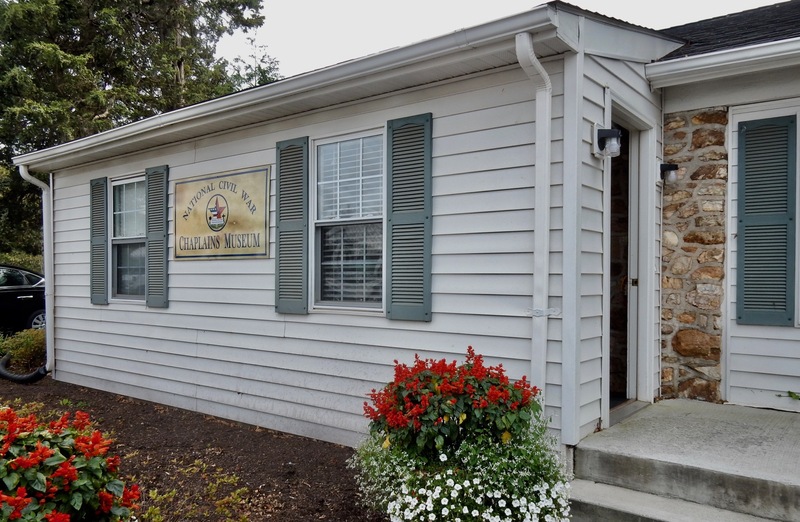 This small three-gallery museum showcases the best of local African American history and art. Opened in 2000 with an exhibit on health and medicine, and then subsequent exhibits on Blacks in the military, life during Jim Crow, and others, it is currently displaying unique and avant garde art. The home itself, a beautifully restored Victorian Painted Lady, might have been owned by a “painted lady” of another sort: supposedly a Madame lived and operated her business from here. The Legacy often hosts music and other events on the lawn – so check the website, and definitely drop by. Open Wed-Sat 12-4 , Sun 2-4, $5. TOUR: Old City Cemetery. 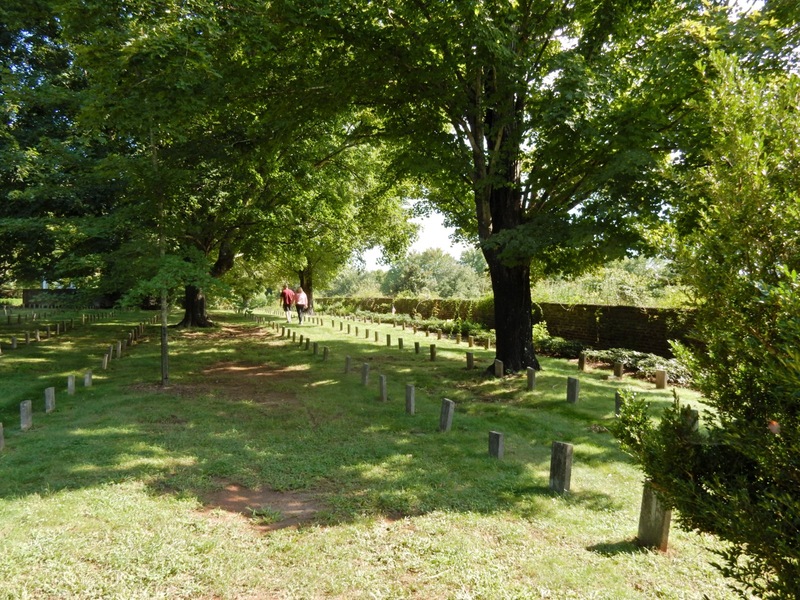 One of the most visited attractions in Lynchburg, this 1806 cemetery is as quirky-fun for the living as it’s a resting place for the 20,000 deceased (including 2,200 Confederate soldiers). Couples book weddings at the on-site chapel, visitors will find engaging walking tours, including the “Bawdy Ladies Tour” (apparently, there are quite a few brothel owners and workers buried here), you can pick up some cemetery-made honey at the gift shop, smell the antique roses, stop into several bite-size museums, like the Civil War Surgery Pest House Museum, the Stapleton RR Station House Museum, and the Hearse House Carriage Museum, and drive around to find random architectural artifacts from demolished city buildings. Weird, wonderful and quiet – not a peep from the residents. 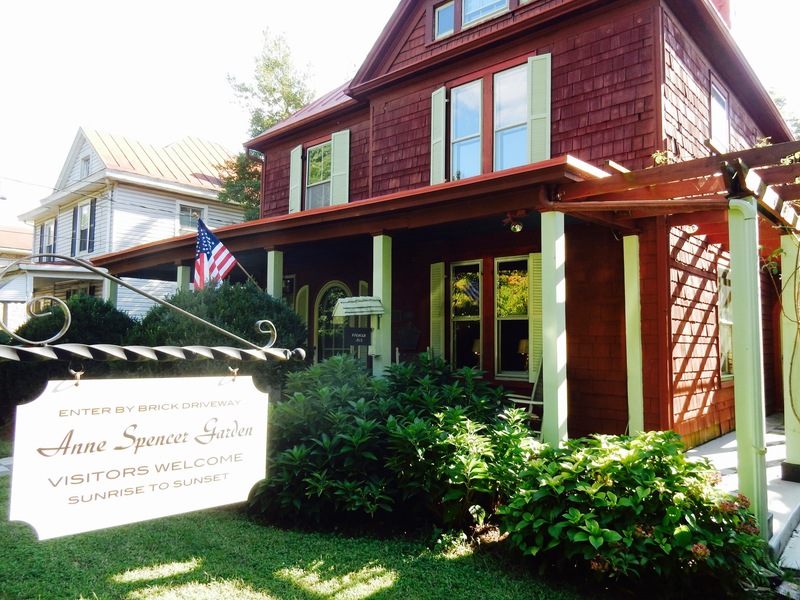 TOUR: Historic Sandusky (Union General Hunter’s Headquarters for Battle of Lynchburg). Historic Sandusky tells the tale of how a private home was appropriated, used, and abused by military officers during the Civil War. Union General David Hunter, a “radical Abolitionist with a temper,” was ordered to take Lynchburg “in the foothills of the Blue Ridge Mountains,” as the city was then a flourishing trade center with a canal, three railroad lines and six turnpikes: In other words – a major hub. To stage his battle, Hunter seized this 1808 Federal style home as Union Army headquarters, locking its occupants – the Hutter’s – in their bedroom. In one of the strangest stories of the war, the Battle of Lynchburg barely got off the ground, thanks to Confederate General Jubal Early, who fooled the Union soldiers into believing that Confederate reinforcements were arriving at a staggering rate by loading the same men into a succession of train cars, one at a time, and having townspeople – mostly the very young, the very old, and the very infirm (as Lynchburg had 30 hospitals) whoop and holler whenever a new train rolled in. The ruse worked, and Hunter and his men retreated, but not before bayoneting the art on Sandusky’s walls, and destroying much of its contents. After watching an 18 min. orientation film in the Visitor’s Center, you’ll proceed to the house where you’ll find it dressed as it was in 1864, with original damaged art on the walls. Open Sat 10-4, Sun 1-5, $5. VISIT: National Civil War Chaplains Museum. Who knew that Stonewall Jackson was an “Old Testament Warrior?” That he never fought on Sunday? This is as niche a museum as you’ll ever find, and, given its religious content, it is appropriately located on the grounds of Jerry Falwell’s Liberty University. In fact, Falwell’s grave, identified by a flame atop a cross, is just steps from the tiny museum’s front door. The NCWCM emphasizes the important role that clergy played in the Civil War, offering comfort, council, and basic necessities to the frightened and injured. Of the 3,462 commissioned Civil War chaplains, there were 17 Black chaplains on the Union side, two on the Confederate side, 11 Jewish Union Chaplains, and for three months, a woman – Ella Gibson Hobart – who after the war, divorced her husband, turned atheist, and became involved in the Women’s Rights Movement. There’s much information about the U.S. Christian Commission, spawned from the YMCA, that handed out bibles, scripture with name and address to wear around the neck (the forerunner of dog tags), and manned Coffee Wagons to keep the soldiers warm and calm. 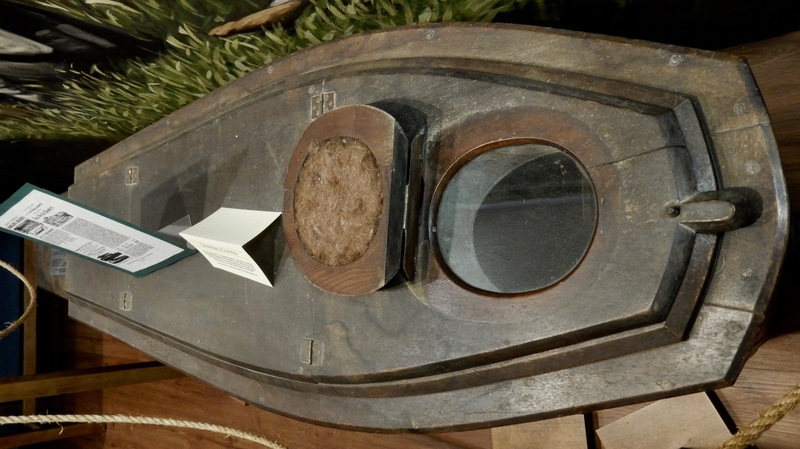 Perhaps the most incredible artifact in the collection is a rare “Shipping Coffin” – designed, with room for ice on top, to keep dead bodies cool on Death Trains back to surviving families. Open by appointment, donations accepted. 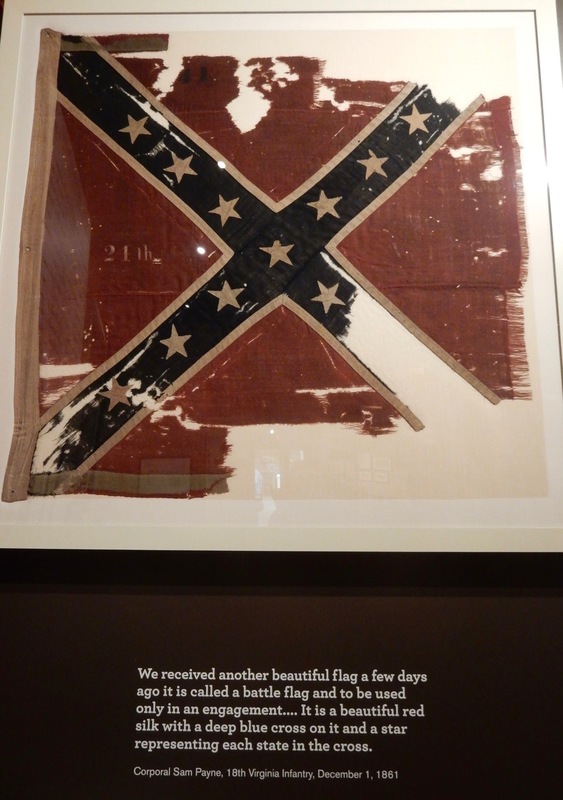 On display are multiple tattered Confederate flags, flown, in no uncertain terms, as “Battle Flags.” Unlike the American Flag, which was created as a symbol of an independent nation, the Confederate Flag was fashioned specifically to be carried on the battlefield. The Sunday after Lee surrendered to Grant on April 9th, 1865, the papers were filled with hope for a more peaceful future. 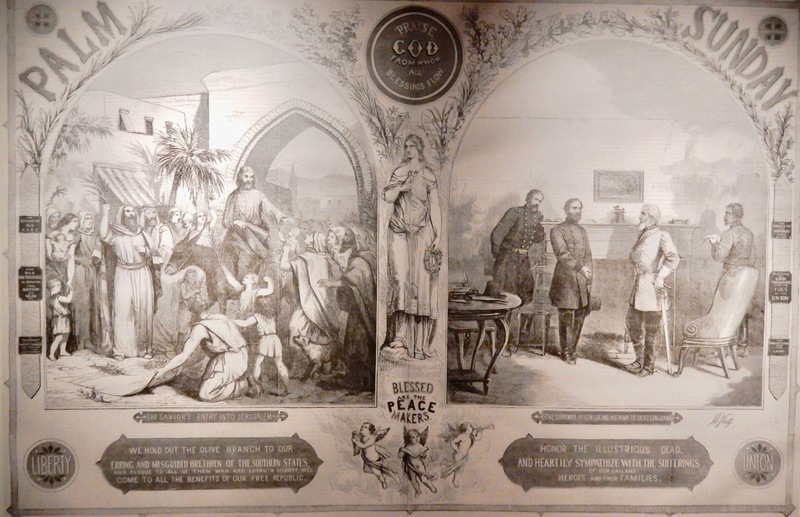 Tom Nast, in a Harper’s Weekly article, labeled Grant the “Peace Maker in Chief,” and went on, “Lee, surrendering to Grant, is barbarous feudalism yielding to Christian Civilization.” Museum open daily 10-5, $10 adults, $5 kids. 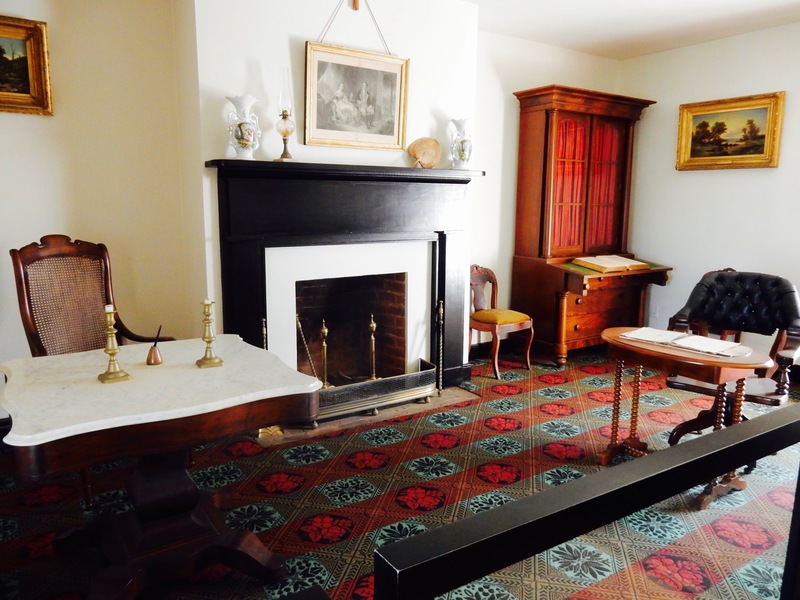 TOUR: Appomattox Court House National Historic Park. 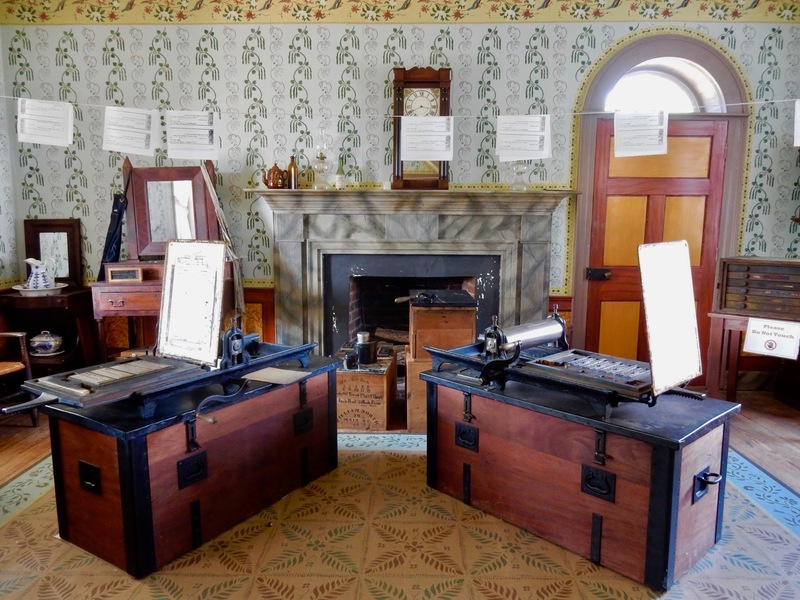 The Visitor’s Center of this historic National Park, encompassing over a dozen buildings, is in the actual Court House of the town called Appomattox Court House. (Confusing? Yes). You can spend a half day here, but if short on time, make sure to visit two buildings: the McLean House, a replica of the home where Lee surrendered to Grant, and the Clover Hill Tavern, the village’s only tavern/hotel at the time, where “paroles” were printed so Confederate Troops could travel home safely. It’s quite humbling to stand on the spot, recreated exactly how it looked at the time, where this pivotal exchange took place. According to a Park Ranger, Robert E. Lee expected to be Grant’s prisoner. On April 9, 1865, he arrived at the McLean House first – at 1pm – in full dress uniform, choosing the fancier marble table. Grant got there at 1:30 in dirty battle clothes and sat at the smaller wooden table. For the first twenty minutes, the two Generals talked about their mutual experience during the Mexican-American War. The generous Grant wrote out the terms of surrender (which included full pardon and safe passage for Lee’s 28,000 Northern Virginia troops). By 2:30, it was over. Open daily 9-5, free. DETOUR: D-Day Memorial, Bedford. 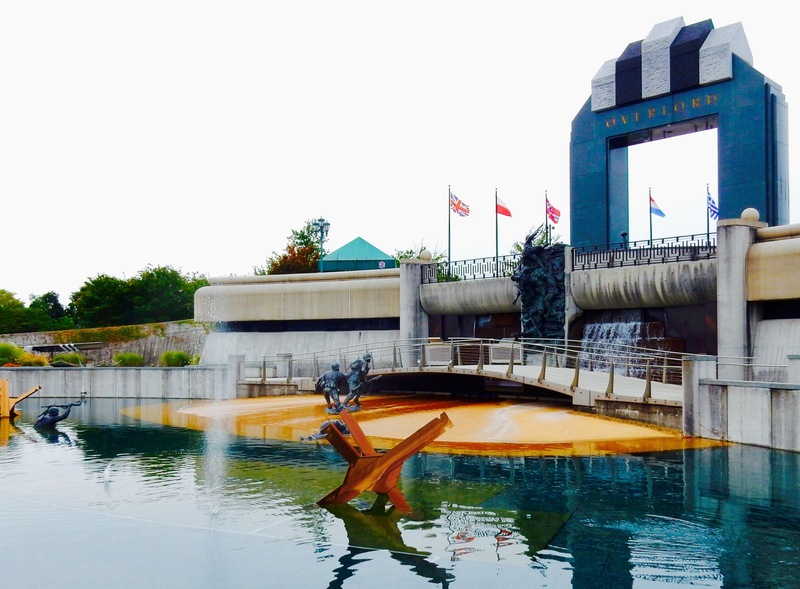 About 40 minutes from Lynchburg in the other direction (towards the Blue Ridge Parkway), this memorial to the Allied forces that participated in the invasion of Normandy on June 6, 1944 – D-Day, the “largest amphibious landing the world had ever seen – is a very worthy and dramatic stop. Monuments and figures of men making their excruciating way through enemy fire are positioned around a large circular plaza. At its center is a basin of water, men emerging from an LST (Landing Ship, Tank) carved in granite, as waterspouts, like shots, fly up around them. It’s powerfully evocative, as are the lifelike sculptures of the soldiers emerging from the fray. 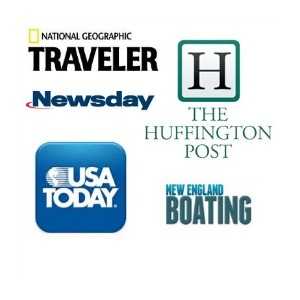 Open daily 10-5, Closed Mondays Dec-Feb, $10 adults, $8 vets and active service, $6 kids. EAT: Isabella’s Trattoria. In the Boonsboro section of Lynchburg, this sophisticated restaurant is a local favorite for good reason. 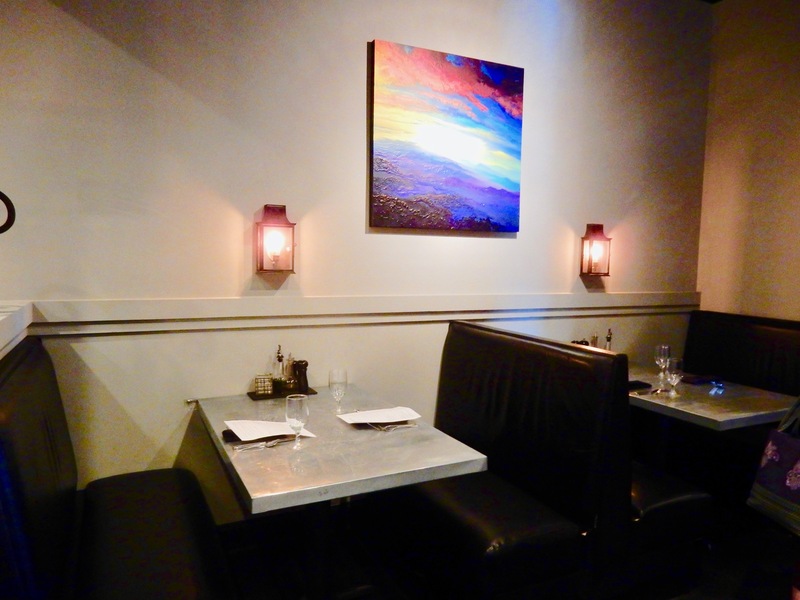 Cool décor – sheet metal tables meet vividly colored contemporary art on walls – compliments excellent and fresh dishes, like the Smoked Salmon Salad ($10). EAT: Waterstone Fire Roasted Pizza. 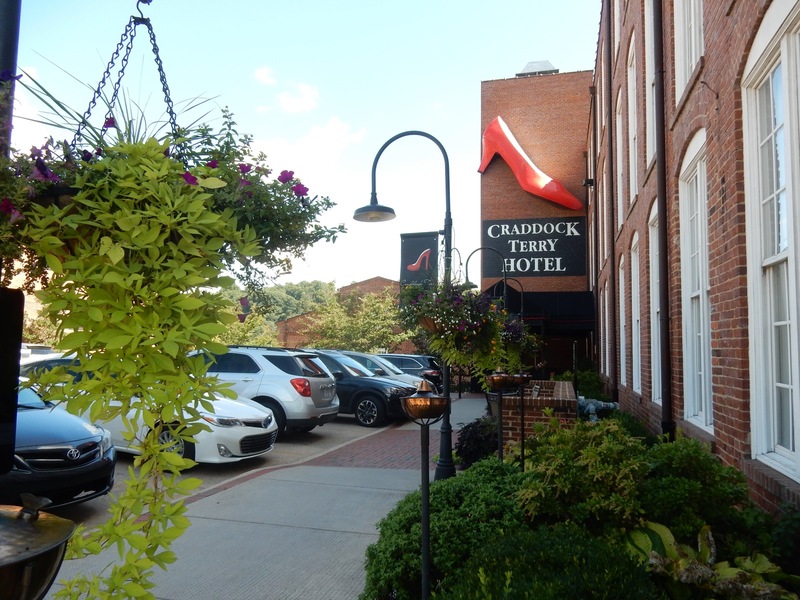 Part of a complex that includes the old Craddock Terry Shoe factory – turned boutique hotel (see below) – Waterstone turns out pretty darn good pizza for a Virginia spot (this, coming from a New York gal). 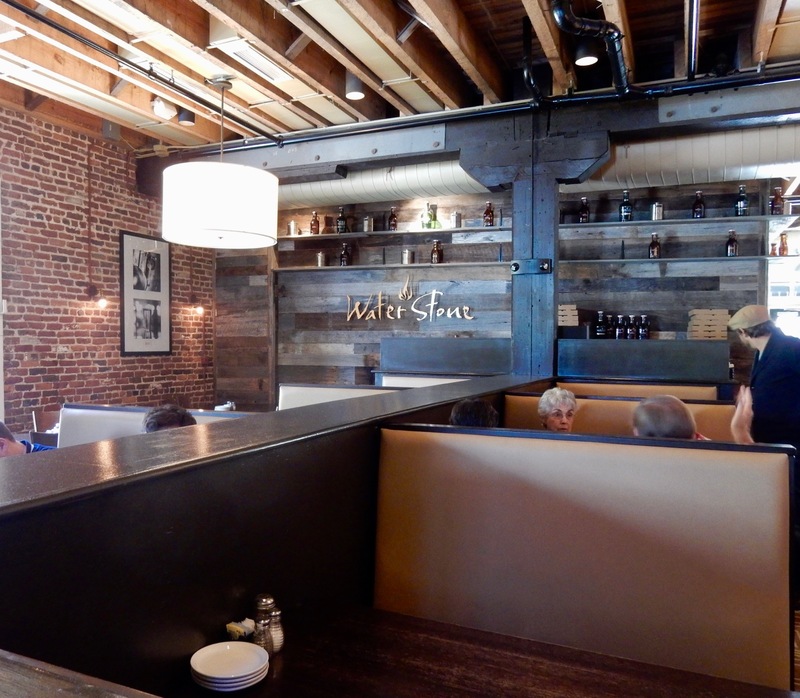 The ambience is brick-barn-wood-raw-ceiling-beams rustic funky and attracts a very eclectic crowd. EAT: Fifth & Federal Station. 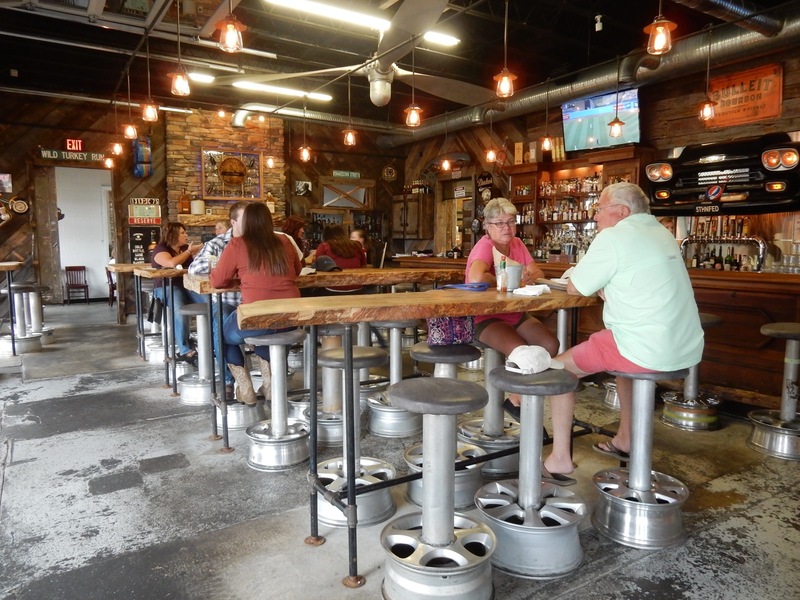 A great BBQ spot in an old gas station, there are nods to its former life everywhere: High top wood tables with wheel-rim-based stools, Tater Tot “Bolts” that arrive at the table in a galvanized bucket, and floors of distressed concrete (thankfully, without the grease stains). Brisket ($11) and Baby Back Ribs ($15 for large half rack) come with a few sides, rendering this trendy restaurant wallet friendly to boot. EAT: Emerald Stone Grille. This restaurant, below Bluff Walk, has all your favorite Irish pub dishes – with a twist. It’s got the basics: salads, fried chicken, “Emerald Wings,” – and then the not so basic. Try the Irish Egg Rolls – oversized fried rolls stuffed with house-made corned beef and fennel-braised cabbage ($10). An appetizer portion with three huge rolls, it’s a meal in itself. For two. 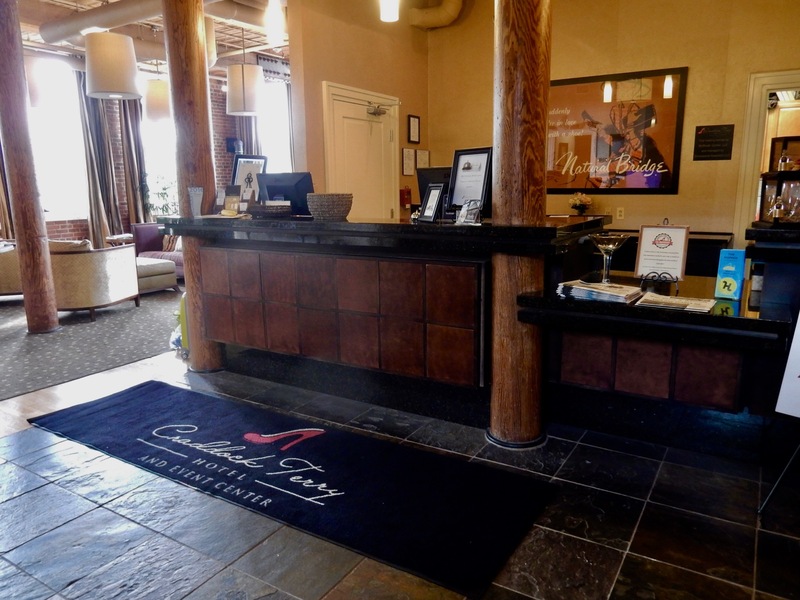 STAY: Craddock Terry Hotel. 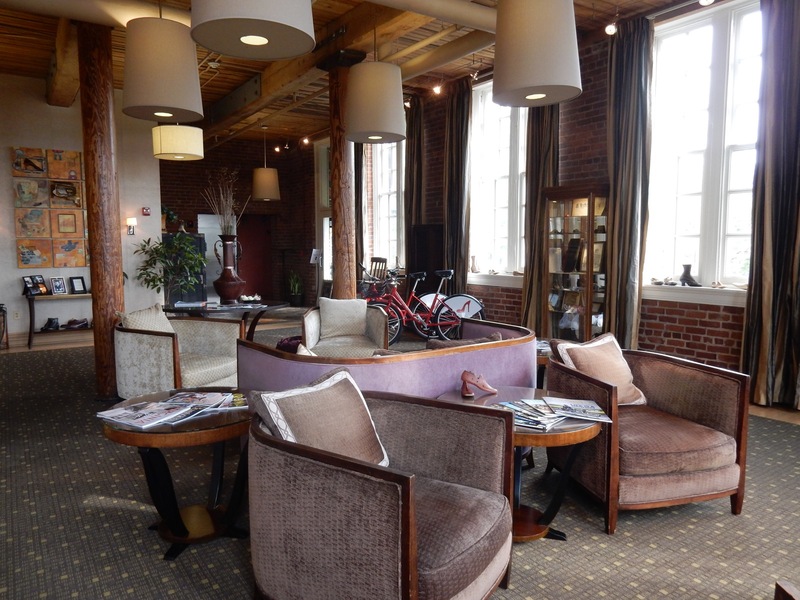 This stylish hotel, crafted inside a gutted and repurposed shoe factory, puts its best foot forward (sorry) with exemplary service, funky aesthetics, and charming, industrial-chic guestrooms. You can’t miss this place – it’s the stately brick building on Bluff Walk with a massive red shoe over the front door. Walk into a comfy eclectic lobby, a bit Victorian-cluttered, a bit showy-shoe museum, with Art Nueveau chairs and couches to rest your weary feet, and, how fitting, a complimentary shoe-shine post (Mon-Thurs 3:30-6pm, “gratuity welcome”). Reception is laid back and friendly, and comes with a map of the property, which sprawls – actually is terraced – downhill, with rooms and restaurants in both the Shoe Factory section (upper) and Tobacco Warehouse section (lower). In the shoe factory building – slat wood steel and beam ceilings soar 12 to 15 feet above luxe rooms handsomely dressed in shades of moss, ecru, and exposed brick. 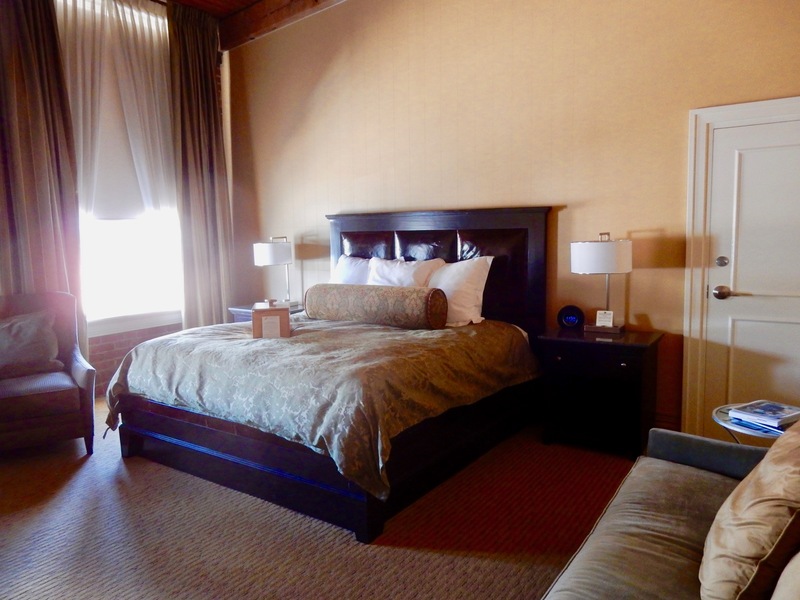 Pillow top beds are the stuff of memories – so sinkably, sinfully restful, they are often the first thing that guests gush about here. There are reminders of the hotel’s history everywhere. Before you walk in, each room is identified by a different type of shoe on the outside of each door (with number below). There’s shoe art on the walls and footwear bath mats. 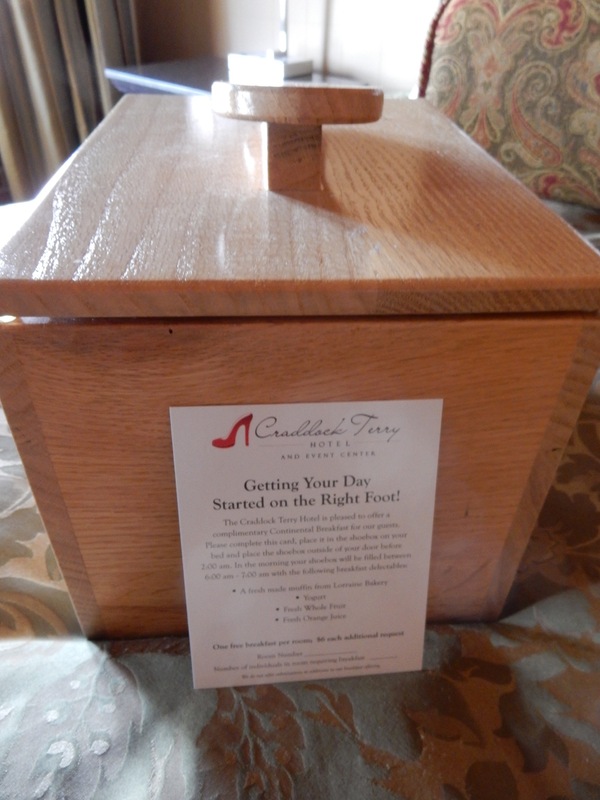 But the coolest artifact is what you’ll find on the bed when you first walk in: a hefty wood shoebox that’s used for breakfast room service delivery the next morning. Fill out the short form inside, leave the whole thing outside your door, and sometime between 6 and 7am, you’ll awake to find a fresh muffin, yogurt, banana, and OJ inside (use the Kerug Coffee maker in the room to complete your morning meal). Though the lighting in the large marble bathroom is a bit dim, the humongous stone tile shower, large enough for two or more, more than makes up for it. 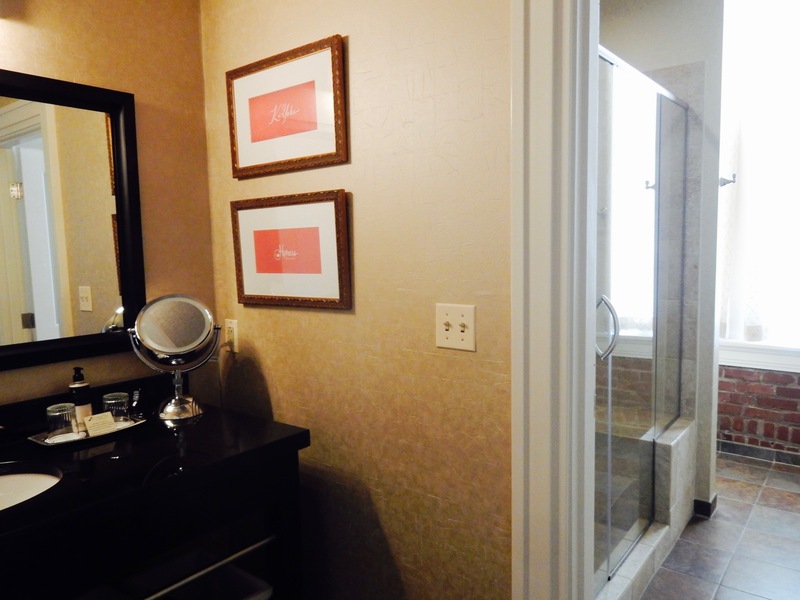 Rooms from $136 – $245 include parking and Continental Breakfast delivered to your door.